It’s my second DJ outing since moving to America and my first this year. What a line-up of bands and unbelievably it happens to be the 12th birthday of Was Ist Das? and what better way to celebrate this than by choosing the tunes at this killer show with 3 of the best bands in Arizona. It’s not a show I’ve organized, it is just a perfect coincidence. The Myrrors are from Tuscon and play hypnotic psychedelic rock, erupting colors into the desert heat haze. 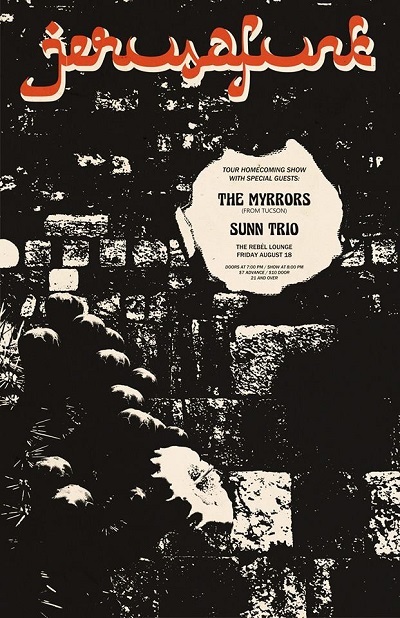 Opening the show are the mighty Sunn Trio, a cosmic onslaught of free jazz, psyche rock and global impulses. This entry was posted in Forthcoming events, other people's events and tagged 2017, Jerusafunk, Phoenix, Sunn Trio, The Myrrors. Bookmark the permalink.